Most Granite countertop sealers work in essentially the same manner; however, there’s plenty of misunderstanding about what sealers actually do. The common perception is that granite sealers form a protective film or shield that absolutely prevents staining or damage to the stone, which is not true. Your countertops can still be damaged or stained even when sealed. Granite countertop sealers dramatically reduce the rate of absorbency of a stone, so it won’t absorb and stain as quickly. Sealers don’t absolutely prevent a stone from being stained, they just make it a lot harder to do, and a stone sealer won’t prevent chemical damage from corrosive “etching” on marble, travertine or limestone. Keep reading to learn the whole story. I’ll explain the myths and facts about how impregnating sealers work and what to expect from them. Sealers, also called “impregnators”, are composed of a resin dissolved in water or a petroleum-based solvent. The granite sealer is applied to the stone, creating a film. When left on the surface long enough, it is absorbed into the pores of the stone, hence the term impregnator. The resin clogs the pores. Excess sealer is wiped off the surface and the water or solvent base evaporates leaving the resin to dry and harden creating the barrier. Sealer keeps spilled substances on the surface of the stone giving you more time to clean it up, so that it is not absorbed into the pores of the stone causing a stain. 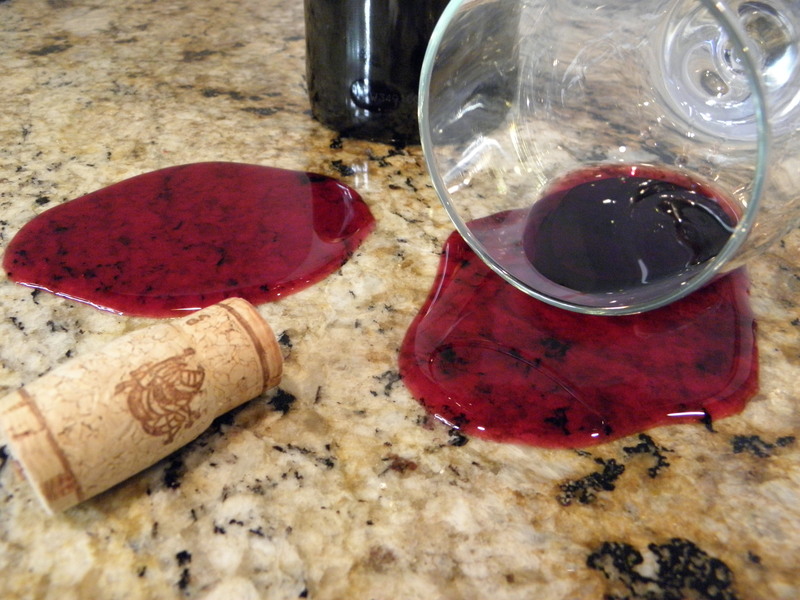 Stains can occur even when the stone is sealed, if for example, coffee, wine, oil or other substances are left on the stone long enough. This is rare, but I’m sure you are wondering…Why or how could this happen? All stones are porous. Some readily absorb virtually anything spilled on them while others are so dense that essentially nothing is absorbed or it takes so long the stone is virtually stain-proof. Logic tells us that the more porous the stone, the faster and deeper it will absorb any spilled substance. 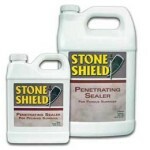 A granite sealer will clog up most pores preventing a deep stain. However, the quality of protection depends on the quality of the sealer and the quality of the application. Sealers do not form an impenetrable shell or film. No sealer, no matter how well applied, will perfectly fill every pore in the stone. It’s more accurately described as a barrier that is highly-resistant to liquid intrusion. Given enough time, some liquid will still seep past the resin barrier into the stone potentially staining. Also, the barrier is just below the surface, so even if deep stains are prevented staining can still occur at the surface level with prolonged exposure. Practically speaking, stains are rare on well-sealed countertops, since nearly all liquids will evaporate before they can absorb. The one exception is oil, which can remain on a surface until cleaned. Highly porous/absorbent stones need to be sealed and periodically re-sealed to adequately control absorbency and the tendency to stain. Therefore, such stones are not the best choice for used and abused areas like the kitchen. Some granite is so dense that it really doesn’t need a sealer. In fact, applying a sealer to dense stones (which tend to be the darker granite colors) like Ubatuba, Black Galaxy, Absolute Black or Blue Pearl granite may only result in a hazy build-up of sealer residue and a dull surface without any appreciable benefit or stain protection. Since such stones are already extremely resistant to liquid absorption a sealer cannot absorb either, which it must do to be effective. It is important to remember that not all stones in the same family (granite, marble, travertine) perform exactly alike. In fact, performance can vary considerably. So it is a good idea to lemon-juice test the stone, to determine if it is suitable for the intended use. Plenty of confusion surrounds the mysterious “water spots” and “glass rings,” which people often mistake for stains. These are not stains. Nothing has absorbed into the stone and sealers cannot prevent this and have NOTHING at all to do with it. This problem occurs with calcite-bases stones like marble, travertine, limestone and potentially even with some granite that has calcite in it. Calcite crystals react with acids, like fruit juice, alcohol, vinegar, or coffee, when spilled on the surface. The reaction, called “etching,” corrodes the surface, destroying the polish and leaving a dull spot on your countertop. It can happen in just seconds. The spots are not as noticeable on a honed surface, but it still occurs. Another reason why calcite-based stones are not the best for heavily used kitchens. Of course, porosity of the stone and sealer quality can vary, but most granite countertop sealers should last 2-5 years and some are rated for 10 years if the stone is diligently and properly cared for. Cutting-edge sealers like SenGuard sealer create permanent bonds with the stone requiring only a single application, and are therefore relatively expensive. Common granite countertop sealers break down over time. The resin is degraded by cleaning products and general use. Even when sealed, the absorbency rate and tendency to stain remains more a function or characteristic of the particular stone than the sealer. Although, the quality of the sealer and application will largely determine how long it lasts before re-sealing is necessary. Porous stones will still be more susceptible to surface stains and will require sealing more often (generally every 1-3 years). Dense stones really shouldn’t be sealed in many cases or may need only one application and never again. Using the simple “Water Drop Test” will tell you when it’s time to re-seal your countertops or floors. Also note that general guidelines of every 1-3 years or 4-6 years are meant only to give you an idea. Every stone is different, so are the sealers and quality of application, so there is no “standard”. You must always test to determine if or when to seal. There is certainly a bit of hysteria regarding granite countertop sealers, and the need for sealing granite is generally overblown. Much of it is recommended and done simply for “peace of mind”… and that’s okay for the majority of natural stone installations. Most stones should be sealed and re-sealed at some point. On the other hand, be prudent and careful in your application when choosing to seal dense stones that may not really need it. You might end up having to pay to strip the sealer when it just sits on the surface dulling your countertops. 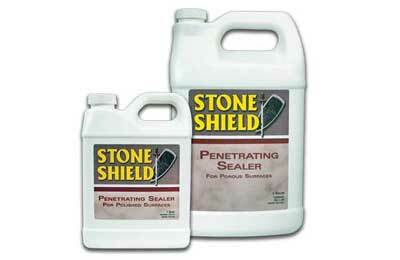 We use Stone Shield sealant on all of our countertops. Why would a salesperson talk me out of marble?